The end of July through August is a tricky time of year in South East Asia – as many places are having their monsoon season. Having spent a month on Koh Chang in Thailand in the rainy season and then a few fun days in Singapore and Batam Island, which you can read about in previous posts, Trav and I were back in Kuala Lumpur and looking for somewhere to settle down for a month or more, where I could get down to some concentrated work on my current writing project and where he could get in some scuba diving. We were also looking for somewhere that satisfied several other criteria too - hot sunshine, a nice beach, and most importantly, affordability. And, quite crucially, to satisfy our wanderlust, it also had to be somewhere we hadn’t ever been before. So, rather than stick a pin in a map, we did our usual research. I’m aware that my posts and photos on Facebook and Twitter and Instagram just show us jetting off and exploring places - but I think you might be really surprised at how much time and effort we spend on planning our travels. Actually, we often don’t go to our first choice of destination. This could be because it would prove too damaging to our current budget or because of the possibility of violent weather (like somewhere being affected by a category tornado/hurricane) or simply because we have reluctantly decided to heed the advice of the UK government’s warning about a place being deemed too unsafe for travel just now. (The UK Gov's website is a good place to check on your travel plans HERE). Anyhow, after doing our research, we decided on beautiful Vietnam. Vietnam ticked all our boxes. We hadn't ever been there before and August is at the end of their hot summer dry season. Our research told us to expect the weather to be good there for at least another month. 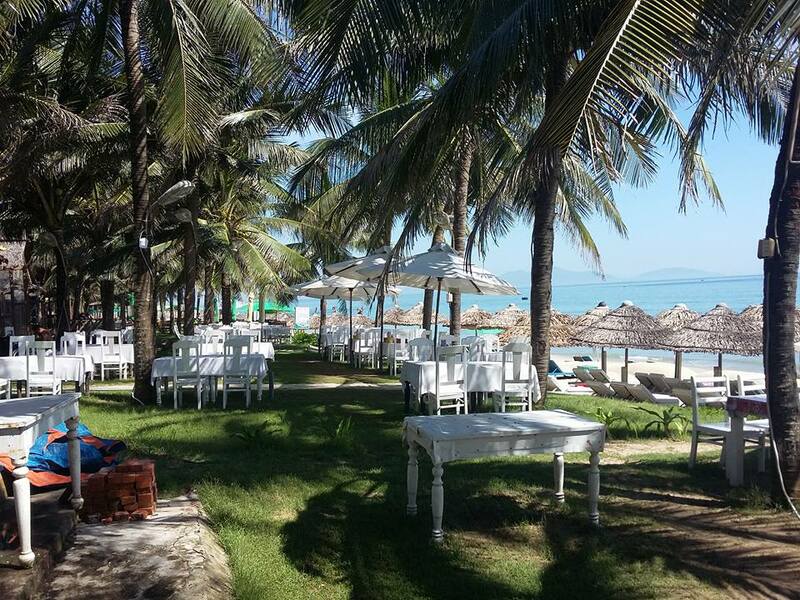 The coastal regions are renowned for their stunning white sandy palm-fringed beaches and scuba diving and, because it was the end of the season, we expected the price of accommodation to be low. Also, we had spotted that Air Asia had a bargain flight from Kuala Lumpur to Da Nang in Vietnam, which is very close to the coastal resort of Cua Dae Beach and the larger An ban Beach, and the beautiful ancient town of Hoi An, which is one of only seven UNESCO World Heritage sites in Vietnam. At this point - but only once I had completed my writing project - we thought our tentative plans might even lead us up the coast to Na Trang and onto Ho Chi Minh City too, as we have friends there whom we’d love to catch up with again. Then maybe to even flying on from HCMC to Siem Reap Cambodia, to take in the amazing sights at Ankor Wat as it has always been on my bucket list? The first thing we had to do, however, to get into Vietnam, was to secure a tourist entry visa. We applied online, and as there wasn’t much difference in the price between a one month or three-month visa, and as we were still unsure of our onward plans, we went for the longer one. Then once the visa came through into our email we were able to go ahead and book our flight with Air Asia. For our accommodation, I looked at Agoda and Booking.com. First, we stayed in a homestay right opposite Cua Dai Beach. 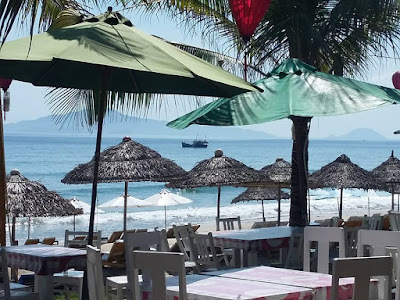 It was clean and reasonably priced – a little bit pricier because of its beach location – but we were swayed by the sea, the sand, the seafood restaurants nearby, and so we booked for two weeks. During those first two weeks, Trav went diving and I sat on the bed writing. Really, for almost two weeks, I hardly left the room in daylight hours and because there was no desk I had no choice but to sit on the bed! When I did FINALLY finish my project (seriously concerned that I'd damaged my bum irreparably) I really wanted to spend my days lying in the sun and swimming in the sea, but by this time, we decided we needed to move into town, where the accommodation was a bit more affordable. So we moved into Hoi An. Again we stayed in a family homestay – there are so many of them in Vietnam and they are run like small boutique hotels. We had a nice room with a balcony overlooking a pool. Luxury in this incredible heat! I should mention that during this time, the weather was so HOT that it was almost unbearable at times. 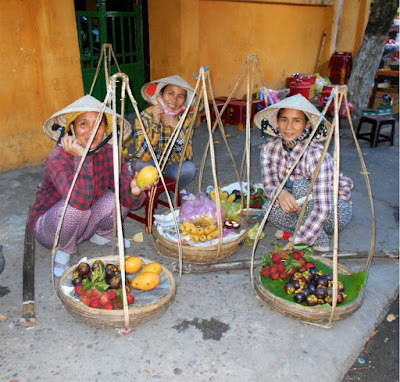 We have been to many hot and humid places in the world and we can usually cope with it - even when we don't have air conditioning - but my goodness I can’t think of anywhere hotter than Vietnam! Consequentially, we spent our days not in town but back on the beach at either Cua Dai or An Bang (and that's when I took all the photos). 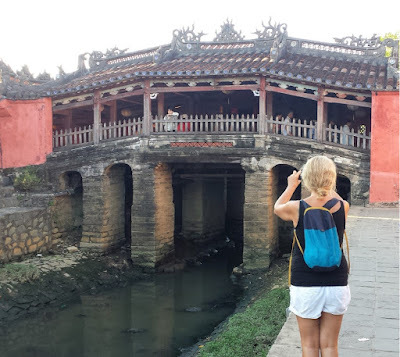 In the early evenings, however, having gone back to our homestay in town for a lovely swim in the pool and a glass of beer, we often took a walk into Hoi An looking for either a restaurant or good street food. 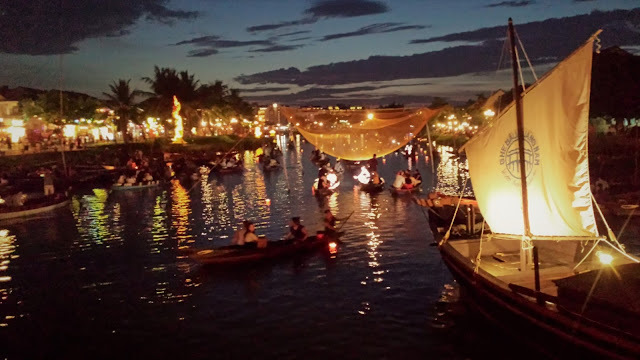 Hoi An is at its best at sundown when hundreds of lanterns are lit and all the traditional old boats are on the river. 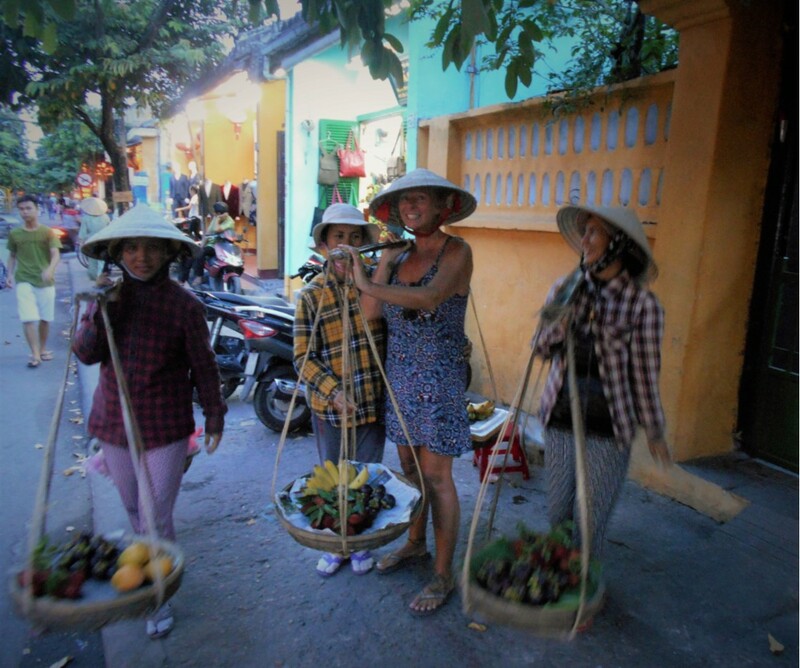 Also in the evenings, the use of motorised transport is banned in the old town and so it is enjoyable to explore the pretty streets at this time, either on foot or in an old-fashioned cycle tuk tuk. 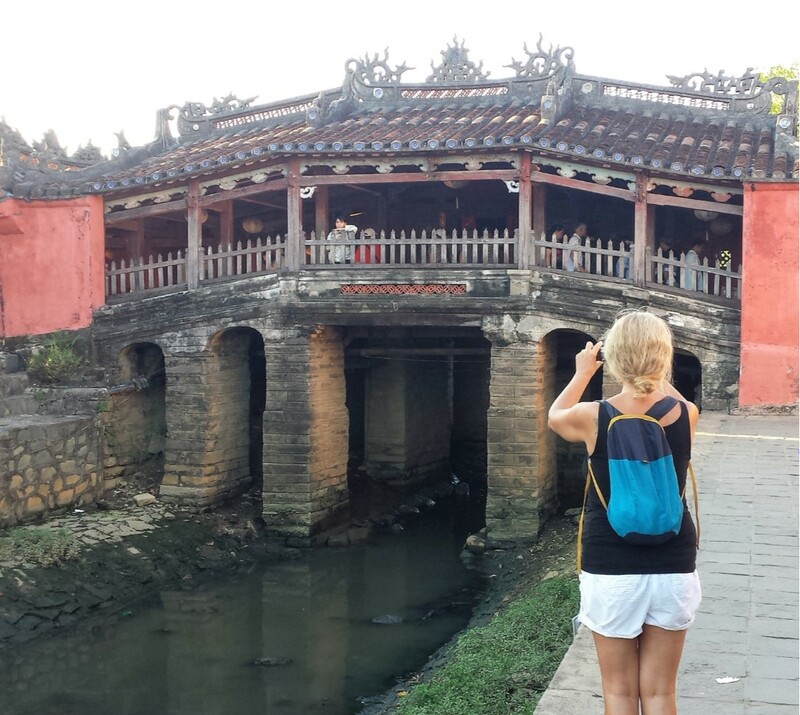 As well as the historic buildings in Hoi An, a must-see sight is the iconic old wooden covered Japanese Bridge dating back to the 16th century, built by the Japanese community. One of our favourite spots in the Old Town was the White Marble Bar – where you can sit in the open (no glass) windows (opposite a fan!) with a vodka lychee martini cocktail (oh wow – they were good!) and watch the world and the hundreds of beautifully dressed Chinese tourists wearing Vietnamese hats being transported around in those cycle tuk tuks. Hoi An is also very famous for its tailors. You can get beautiful clothes made to measure very inexpensively here. 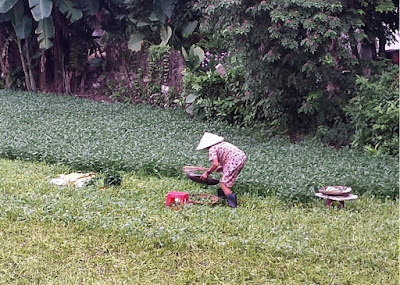 It seems that every Vietnamese in the town is a dressmaker or seamstress – as was our landlady, Moon. I had a dress made by her during our stay (that's the fabric below right) and Trav had two linen shirts, a pair of smart city trousers, and his old denim shorts that were falling to bits perfectly replicated. We were delighted. You'll see the resulting outfits being worn in an upcoming blog post! After spending a whole month in Vietnam in Cua Dai and Hoi An, quite spontaneously, we spotted an absolute bargain flight to Seoul in South Korea. We immediately called our son James and his wife Sujeong, to ask if they were up for having us come over to see them and our grandson Aaron and the Kang family of South Korean in-laws. Like many of our spontaneous trips – they are booked on the basis of a favourable price – and this flight, in ten days time, was from Hong Kong to Seoul return. So we just had to plan to be in Hong Kong in time for our flight. We had been to Hong Kong once before – but only as a transit stop between flights. I fell in love with Hong Kong when I had looked down at the city from our plane and saw it lit up like a Christmas tree as we flew in. So this was our big chance to spend a few days and nights there before flying onto Seoul. I’d also always wanted to tag a couple of nights in Macao onto a Hong Kong trip too. Macao, known as the Las Vegas of Asia, was just a one hour ferry from Hong Kong. I could see a fabulous adventure materialising before my eyes! So we abandoned our plans to explore more of Vietnam and Cambodia (for another time) and we flew back to Kuala Lumpur for a few days - not exactly a direct route to Macao and Hong Kong - but it actually worked out cheaper as all the bargain flights were out of KL. Good job we don't mind flying! So, at the end of August after spending a whole month in Vietnam, we were back in our Asian hub of Kuala Lumpur for a few days. We relaxed at our favourite hotel just outside the city and we booked flights, hotels, and looked up transport schedules for buses, ferries, and trains in Macao and Hong Kong and South Korea. See, I told you we did a lot of research and planning. While we were back in KL at this time, through his own research, Trav happened to find the right tattoo artist to do our ‘his and hers half-sleeve travel tattoos’ that we had been talking about doing this year for our thirty-fourth wedding anniversary, and so we jumped at this fabulous window of opportunity. These are our final fabulous designs for our tattoos. You see mine (left) has a feather pen to represent my writing. Trav's (right) has a diver to represent his passion for scuba diving. 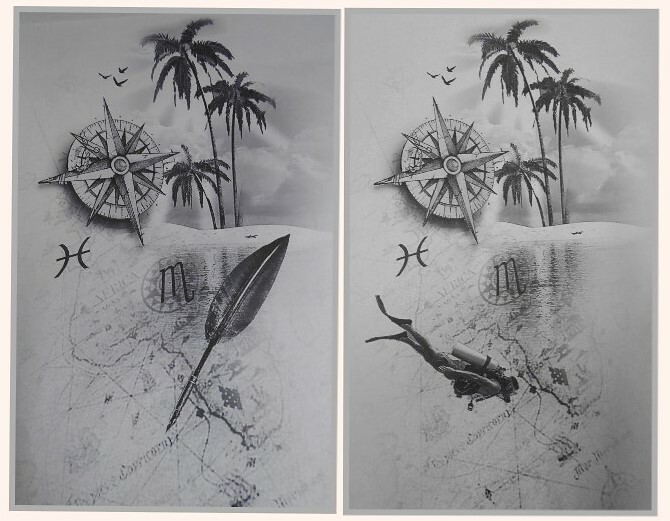 Both tattoos have a compass and a map and palm trees and our astro signs. Please do join me in my next post, where I’ll be excited to show you our fabulous new half-sleeve matching travel tattoos now permanently on our arms! Thank you Kit. Vietnam was sooo hot and very beautiful although we only got to see a small part of the country. We will absolutely have to go back there again one day to explore further. Over the next week or so I hope to write up another few posts covering our exciting travels to date.